Don’t Forget the State Budgets! Of course, Karl only looked at federal government revenues. However, with my state budget OCD, I immediately saw the flaw in this analysis. As one would expect from a public economics professor, he did a good job of controlling for inflation and population, but he forgot that the federal government isn’t the only one with it’s hands in our pockets. 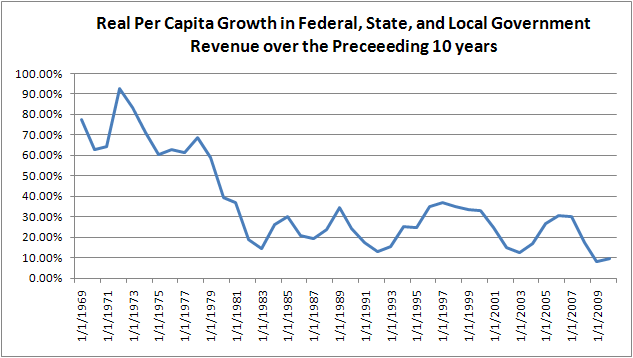 Here are his graph of real per capita federal revenues and my graph of real per capita federal+state+local revenues. The peak and trough from this last business cycle look very slightly lower, but my eyeball estimate is that it’s not significant. 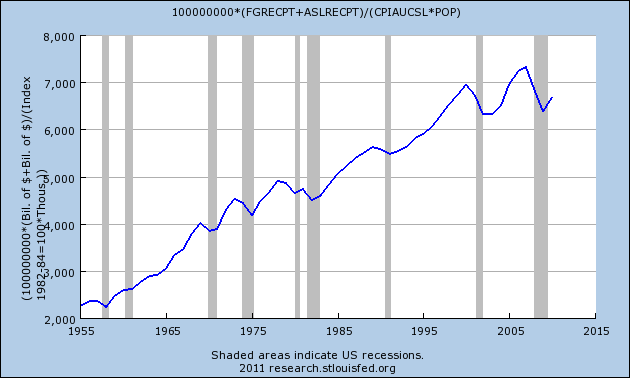 Government spending has continued it’s inexorable rise. All that’s happened is we’ve shifted the relative tax burden modestly from the federal level to the state+local level.